As a provider of resident services in affordable housing for over 10,000 units across Massachusetts, Peabody Properties appreciates and supports Peter Shapiro’s bringing this level of expertise, an essential component in successful property management, to small property owners. This valuable guide offers a way to get big-firm capacity into the hands of small property owners. Based on our experience, this Good Landlord approach is already proven and makes good business sense, as it is a less costly approach to resolving challenging resident situations. If you want results, then read this book! This is an excellent publication that will be a great resource for any landlord, community development corporation, property management company, or nonprofit housing group. It offers an easy-to-read, well organized, and comprehensive overview of the key issues facing landlords, and will help them earn a fair profit while serving their tenants well and being a good neighbor. A must-read for any small property owner! This book teaches in plain English how to make landlord-tenant relationships work for your own good and profit! Filled with stories, tips and time-tested advice, The Good Landlord will inspire you and make landlording truly worthwhile. I recommend it highly! Peter Shapiro’s The Good Landlord will help small property owners to manage their businesses more effectively, increasing profitability and lowering stress. Filled with thought-provoking ideas and time-tested strategies, this book offers landlords sensible ways to resolve tenant disputes while doing the right thing. Not an easy balance! With this highly practical guide, small property owners will find a way to address the most intractable tenancy issues they face. I highly recommend it! Learning new things and using that knowledge to solve problems are vital to the success of landlords, big or small. This publication provides perspective and insight on issues that owners can use to address problems on a daily basis. Whether you became a landlord by accident or intention, you need this book to navigate the uncertain waters of renting. Our home, whether we own or rent, has a powerful emotional pull. Shapiro, with the wisdom of years of being a “good landlord,” has written THE book on the subject of being a landlord (not a dirty word). Not everyone will or should own their home. Many need to rent. If you are currently, or are thinking about becoming, a landlord, please buy this book and read it, and by all means do the exercises. It will not only make you a better landlord, but a better person. Not many books can claim that! Shapiro’s advice would have helped me avoid the problems I have had as a landlord. I only wish he had written it sooner! Landlords are stewards of the earth; we are just responsible for a bigger share of it than are others. For over twenty years Peter Shapiro has guided me to manage the challenges of leasing, handling repairs and negotiating with the many personalities involved with landlording. Peter has helped me maintain open communication and identify my long term best interests. The result? One hundred percent occupancy, full rent collections, no evictions, and positive relations with every tenant! Now Peter’s expertise is available to everyone in The Good Landlord. I can’t recommend Peter Shapiro’s book The Good Landlord enough! It is packed with invaluable advice and stories on how landlords can overcome difficult and challenging tenants in a positive way. Whether you are a new or a veteran landlord, this book will surely provide you with strategies to navigate the real estate business and put more profit in your pocket! In this timely work, Peter Shapiro offers property owners and the housing industry not merely a robust landlord guide but valuable insight into how to yield a return and thrive personally. The practical tips and strategies provide sound advice for improving the bottom line for landlords and tenants alike. Bravo for Peter’s compelling argument as to how landlording can be a force for good. My partner and I have had the privilege of being Peter’s tenants in Jamaica Plain for the past seven years. Having witnessed firsthand Peter’s application of the lessons presented in this book, we know they work! Peter is truly a fair-minded, responsive, kind and thoughtful landlord who also does well. If you are considering renting a unit out to tenants for the first time, or want to learn how to be a more fair-minded landlord and thrive, I recommend this book! Peter cares for his tenants as well as his own bottom line— and has many positive, long-term tenancies to show for it! As one of Peter’s tenants for the past five years, I can tell you that he is a good landlord! Peter allowed me to manage my tenancy in order to keep me financially secure throughout graduate school, a major surgery, and a stressful job search. I would not be in the stable position I am in right now, with a great job, without Peter’s support. He is responsive to problems in the unit and willing to make improvements as needed. But Peter’s not a pushover. He gets a return on his investment and has a healthy mortgage to pay! I’ll never find a landlord I feel quite as comfortable with as I do with Peter! The Good Landlord will help you keep the rent flowing without costly eviction disputes. Peter Shapiro’s book shows how landlords and tenants can work together for their mutual benefit, and his extensive experience is evident in this excellent guide. Read this book: the valuable tips and techniques in The Good Landlord will ease your tenancy challenges—and save you money. Peter is a down-to-earth landlord who practices what he preaches, and his principles are sound. 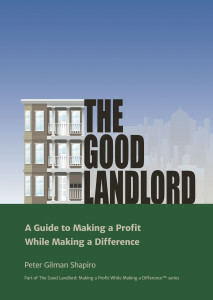 I can vouch for this as his tenant and after reading his wonderful book, The Good Landlord: A Guide to Making a Profit While Making A Difference. Peter is willing to listen, find common ground, and then make decisions that everyone is happy with, including him! This book is filled with useable information and advice that will help landlords to thrive by day and sleep at night! Peter Shapiro’s remarkable—indeed ground-breaking—book provides a treasure trove of good advice for landlords who want to make the world a better place. Combining both emotional intelligence and spiritual intelligence, The Good Landlord uses narrative, sample dialogues, checklists, and even cartoons to teach how good intentions are not enough—skill in communication, relationship-building, boundary-setting, and negotiation are essential. Peter guides the reader—with specific, how-to examples—to a collaborative approach to being a landlord, one in which both relationships and results are pursued. Beginning his book with a quote from the Buddha and ending with eminently practical guidance on managing the eviction process while simultaneously pursuing a mutually agreeable settlement, Peter gives new meaning to the term “enlightened self-interest.” The Good Landlord is more than just an essential book for landlords; it’s a major contribution to the growing shelf of business literature that teaches people how to combine principles and profit, commerce and compassion—and how to do well by doing good. The Good Landlord is filled with good advice! Drawing on the most important ideas in the negotiation field, and tying them to real life challenges landlords face every day, Peter Shapiro clearly shows how landlords can meet their own interests while helping tenants to meet theirs. That’s quite a feat, especially in hard times.